Dream killer Z. First generation Datsun 240Z fans hide your eyes. 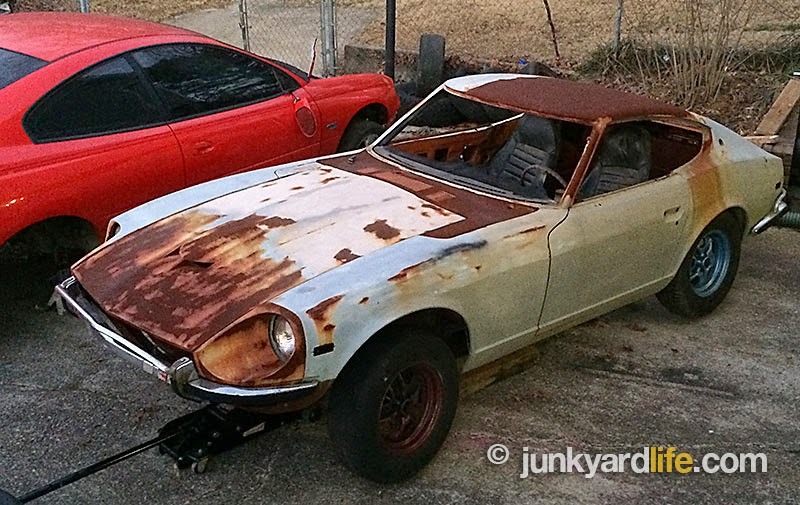 This 1972 Datsun 240Z found its way to the parts pile after a failed restoration consumed $30,000 of the original-owner’s money. 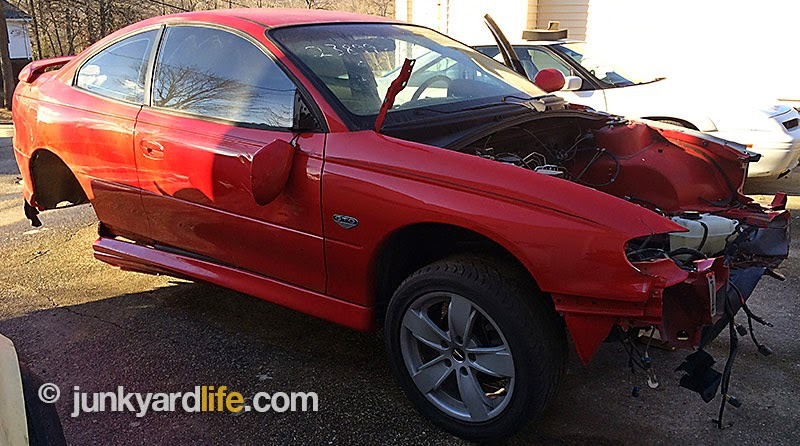 Time, money, and a 2004 Pontiac GTO were used (some may say abused) by the builder until the owner tossed in the towel on their hybrid Z plans. 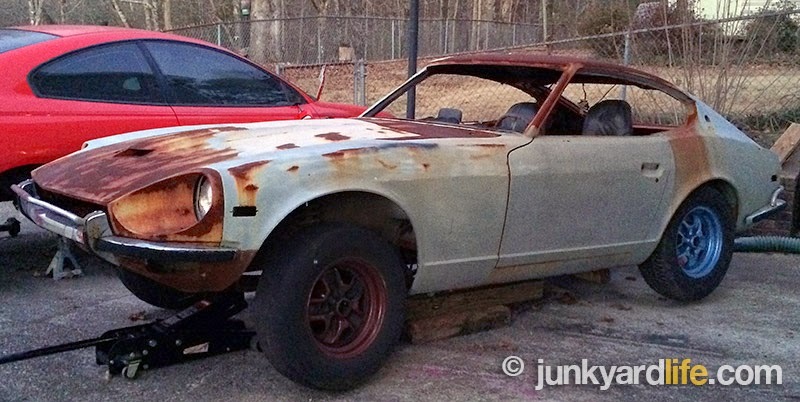 The sight of a much-loved, rusting ’72 Datsun was more than they could stand. 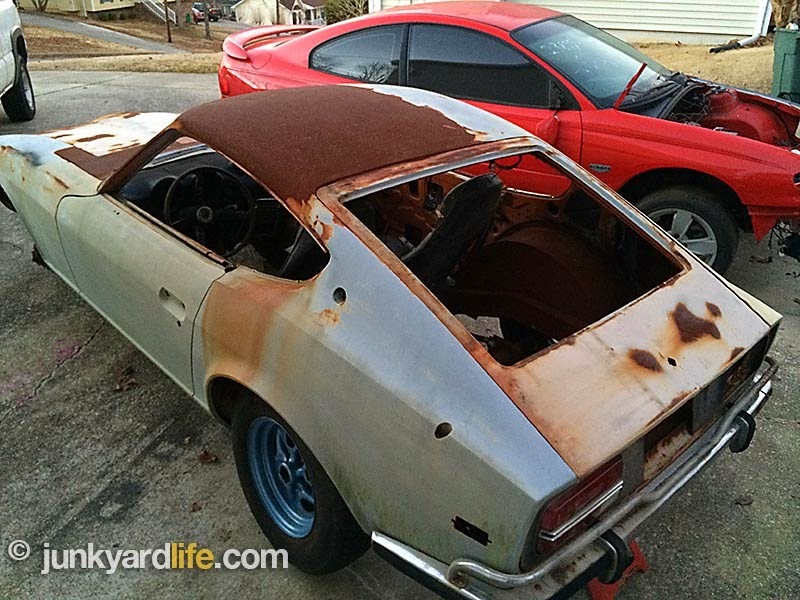 The owner sold what was left of the 240Z, along with a stash of new and used parts, and the remains of a ’04 GTO for a few hundred bucks. 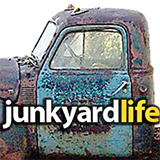 This fortunate junkyard scavenger scooped up the deal, now I’m dishing out the details. 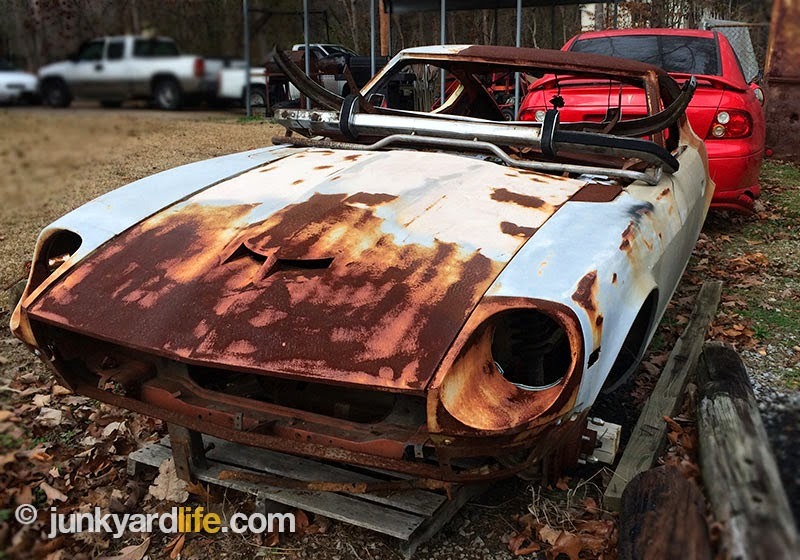 1972 Datsun 240Z project car tumbles into parts car disaster. 14-inch wheel tubs, boxed frame and ladder suspension surround the GM 10-bolt posi rear end. 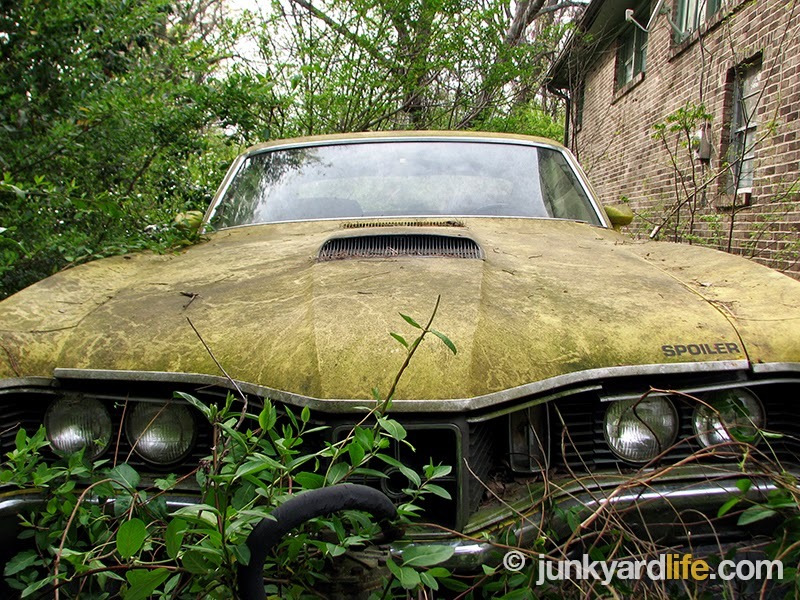 Most failed, project car restorations fall into one-of-three categories. Inexperience claimed this 240Z. Money flowed into the project to revive the orange Datsun that the original owner’s had dated in 40 years earlier. Plans were to make the rejuvenated Datsun a family heirloom. A car to be kept in the family and handed down to the next generation. This would be money worth spending, or so they thought. The owners continued to write checks and the ’72 240Z project total climbed higher and higher. Finally, unsatisfied with the amount of work that had been completed by the builder, the owner cut the life line on the build. A sickening amount of money had been spent on what looked like a disaster. Checks piled up totaling $25,000 in parts and labor on the Z project, combined with another $5,000 spent on a wrecked 2004 GTO, for its LS1/6-speed drivetrain. 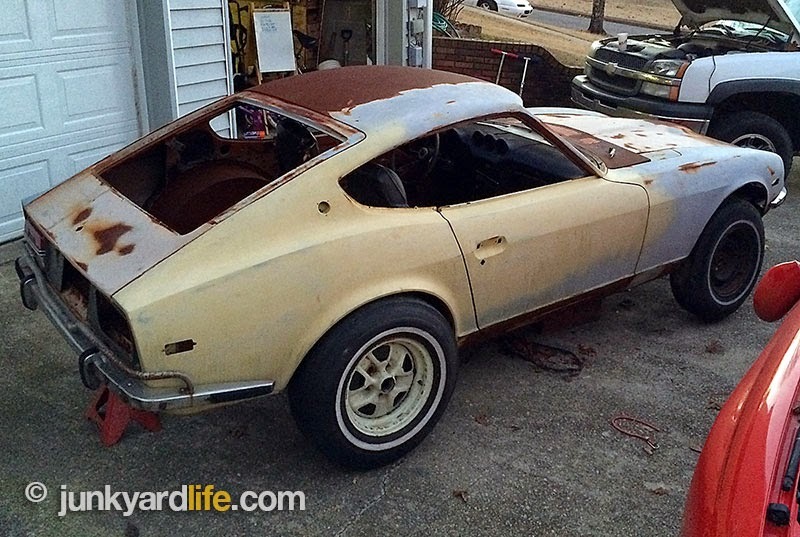 The naked, gutted shell of the 240Z looked much worse that it did before the project began. Needless to say, the car owner and 240Z builder are not on speaking terms. Fabricated twin snorkel scoops in the 240Z hood prove the builder had skill. Feeling regret and the sting of investing with their heart, the owners were too pained to look at their once-proud 1972 240Z. 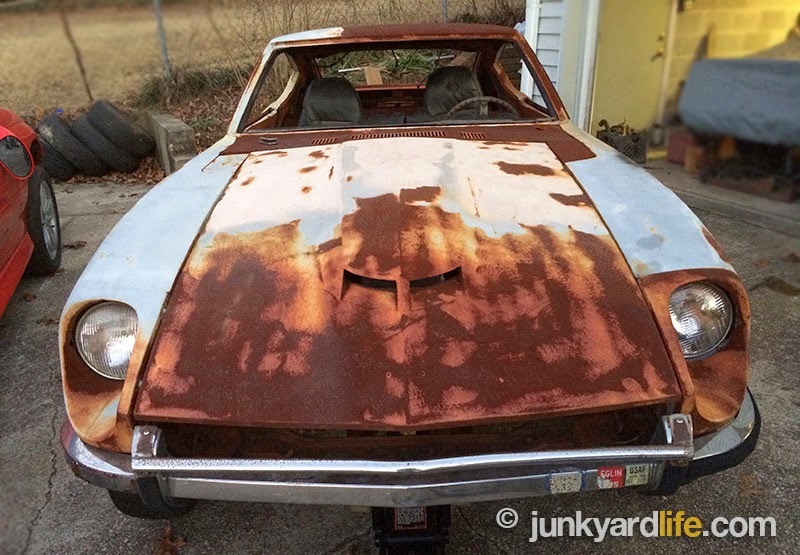 The reclaimed remains of the Z project and the GTO were hauled from the "restoration" shop. 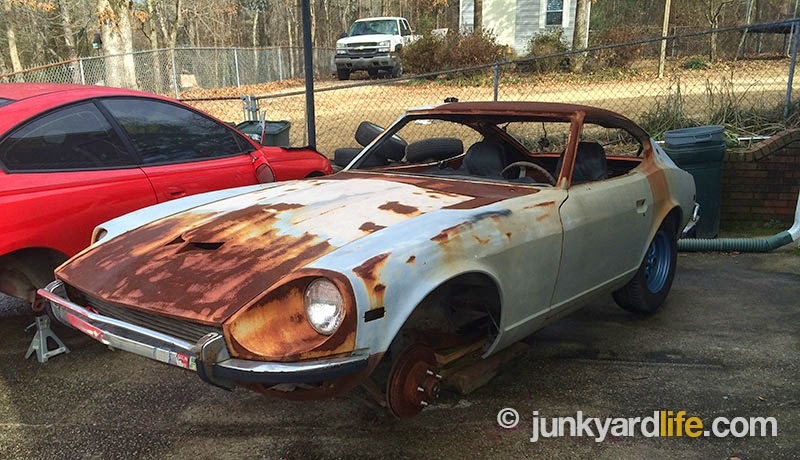 The Datsun, with half the body stripped of paint was stored at another location for two years. Unfortunately, it was stored uncovered. Outside. 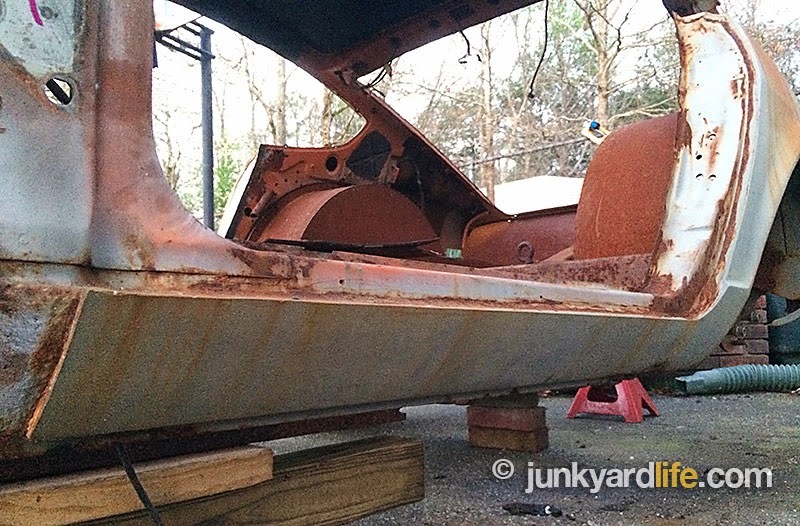 The exposed, bare metal on the Z turned orange with rust. 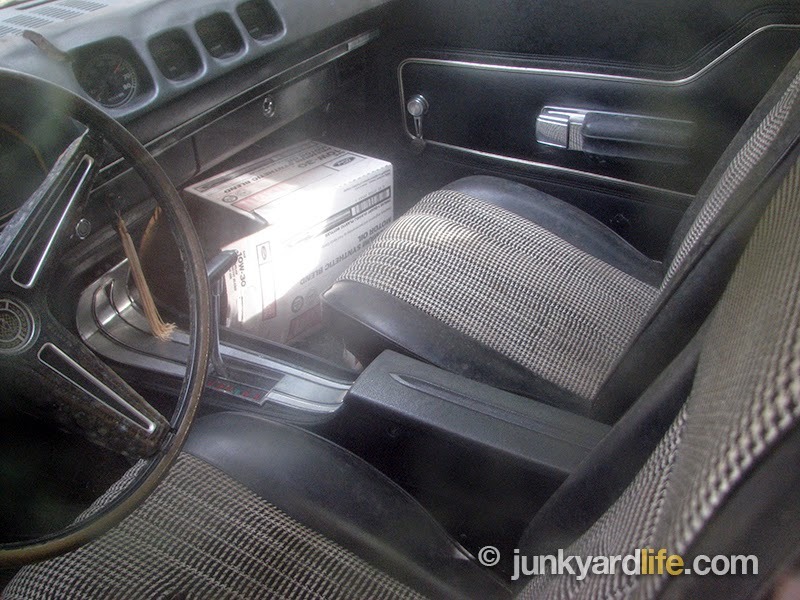 Cardboard boxes filled with 240Z parts were stashed inside the GTO, where field mice soon found shelter. Storing cars outdoors never ends well. The Datsun was built with an LS1 engine and 6-speed transmission from the red 2004 GTO in mind. The project Z and GTO needed a new home after 2 years of outdoor storage. I found myself in position to make an offer, one that I thought would help the two parties involved. Buying the cars would remove the burden from the dejected owner and get the cars moved off the third party’s property. Everyone wins! A deal was made and the 240Z and GTO soon landed in my driveway. 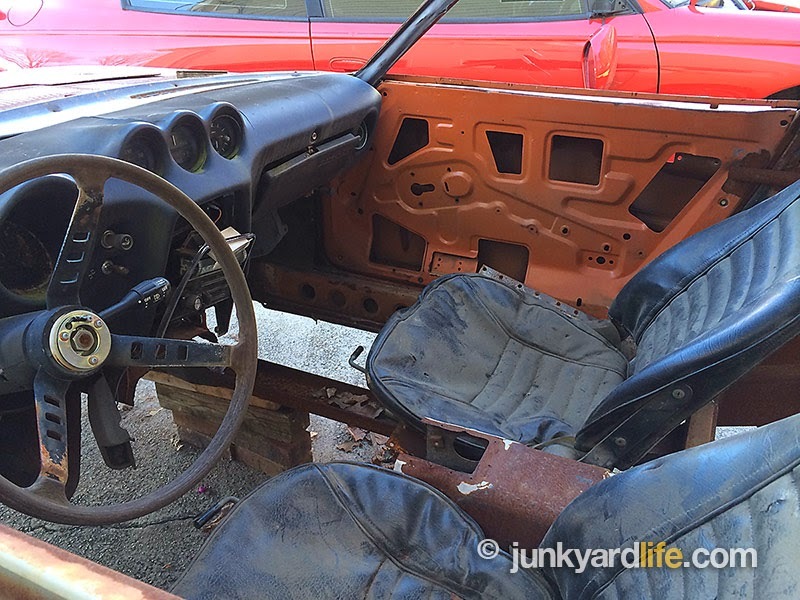 My plan was to turn this 240Z project into some fast cash. 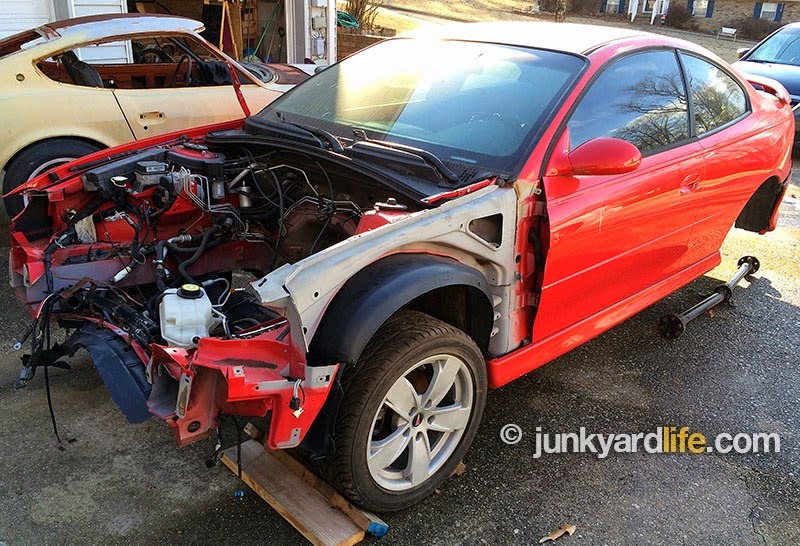 Who knew modern GTO parts were so expensive? 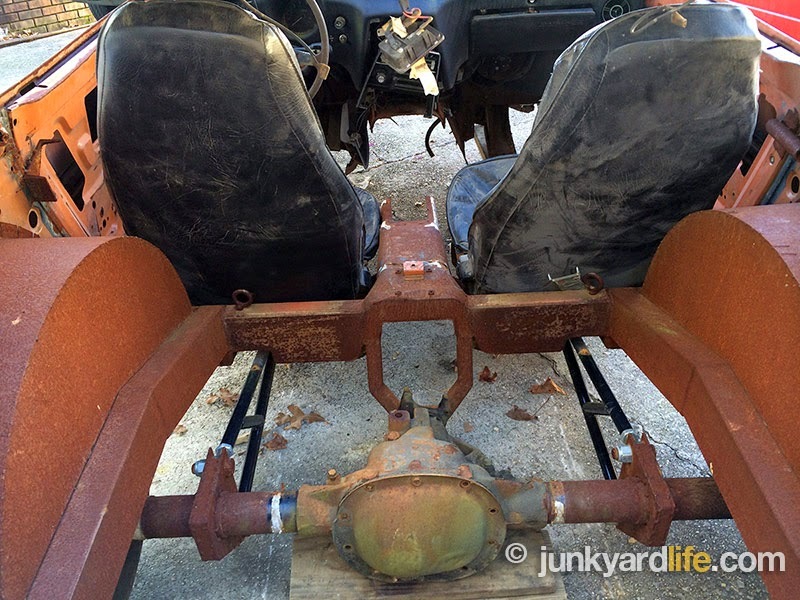 $900 fenders – Outrageous! GTO’s seats and speakers were gone but everything else remained intact on the interior – except what the mice might have chewed. I'm sure you’ve heard the expression, "the whole is greater than the sum of its parts." That does not apply to cars. I quickly learned, after I sold the GTO, that I could have made more money by parting the car out. I sold it too cheap. I listed the GTO for sale on craigslist.com. Soon after, a paint and body professional showed up at my door to make the purchase. The buyer informed me, as he loaded up my GTO, that a 2004-06 fender fetches $900 and up, based on insurance repair estimates. He said parts are sky high because you can’t get new factory GTO parts. He also surmised that insurance companies would rather "total out" all wrecked GTOs because they are too expensive to repair. I wish I had kept the GTO or been more diligent about parting it out. 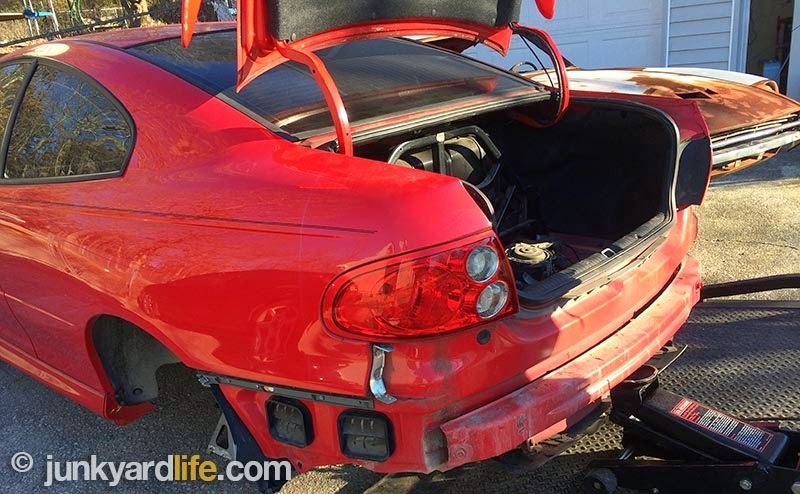 It is easier than you think to remove the bumper cover on an ’04 Pontiac GTO. Moving the car was a chore since the independent rear end was long gone. Original 240Z horn buttons must be rare judging by the amount of calls. I found plenty of 240Z parts buyers online. Several buyers showed up to pick the 240Z apart. First the bumpers, then fenders, struts, dash, steering wheel and column with key. I had a few boxes of new parts (rubber, emblems, handles) but found myself dealing with guys who wanted to bundle items based on the total price I was asking. The best parts went first. One guy loaded up my 240Z’s fenders and headlight buckets into his 1975 Z car and drove away. There was little room left for him to shift gears. As the parts selling process continued to drag on, I decided to let it all go. Just one problem. Not much was left. All the removable parts are gone. 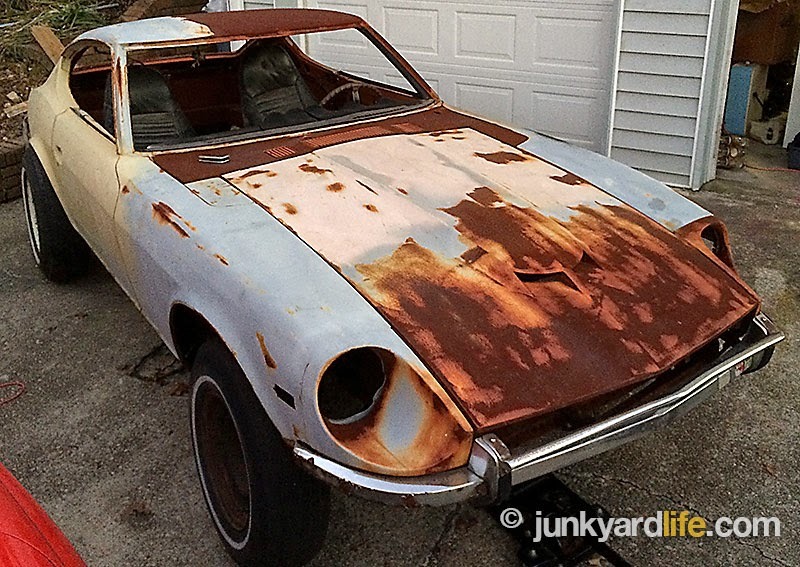 Who wants the shell of a butchered 240Z? It could be yours, if the price is right. Rusty junk 240Z had a 5-lug swap all around. One guy showed up just to look at how it was done. 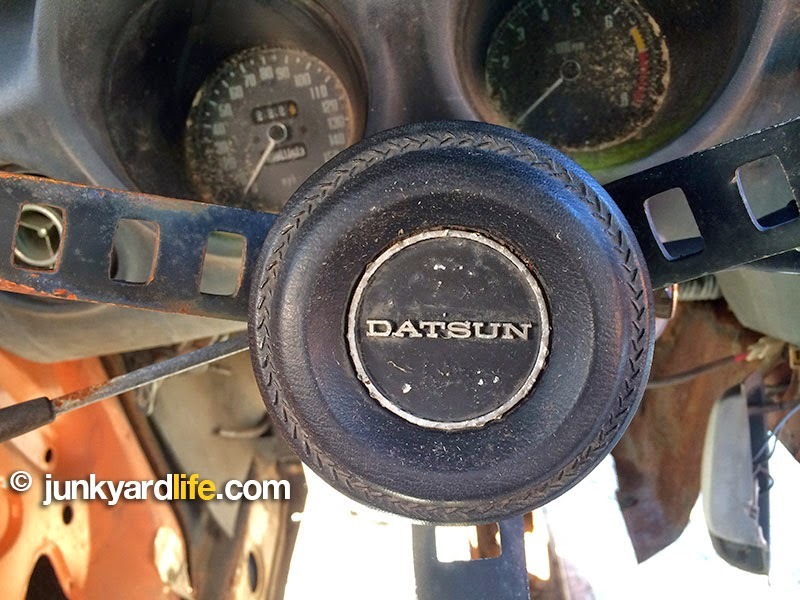 My ad for the 1972 Datsun 240Z did mention that it needed work. Floorpans would have been a good place to start. Who loves Oldsmobile rally wheels on their Datsun 240Z? Parts went on the 240Z for photos and back off when items sold. 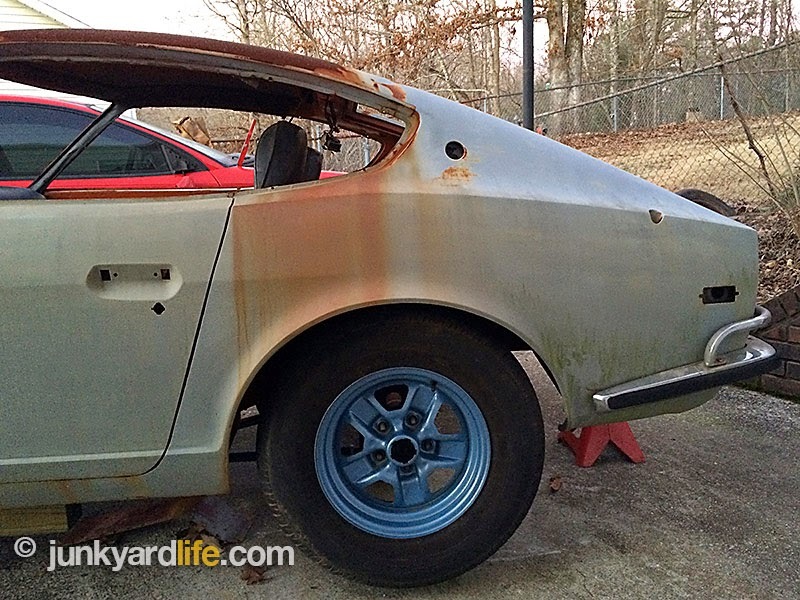 Surprisingly, the body of the 240Z has very little rot despite the glaze of surface rust. The Datsun and GTO filled up a large corner of my driveway. Solid rockers on the hot rod hybrid Z make it hard to haul the stripped shell to the scrap yard. These two cars will return to the road one part at a time. The perfect storm. “Unlikely” is what we thought when we found this hidden treasure. Jody and I traded phrases like, “No way!” and “You gotta be kidding me!” We had spotted an elusive 1970 Mercury Cyclone Spoiler in the wild. Mercury wanted an eye popping muscle machine to compete with everyone. Nascar, NHRA, and anyone else located in Red Light, USA. And the new, for 1970, 429-cubic-inch monster would do it. 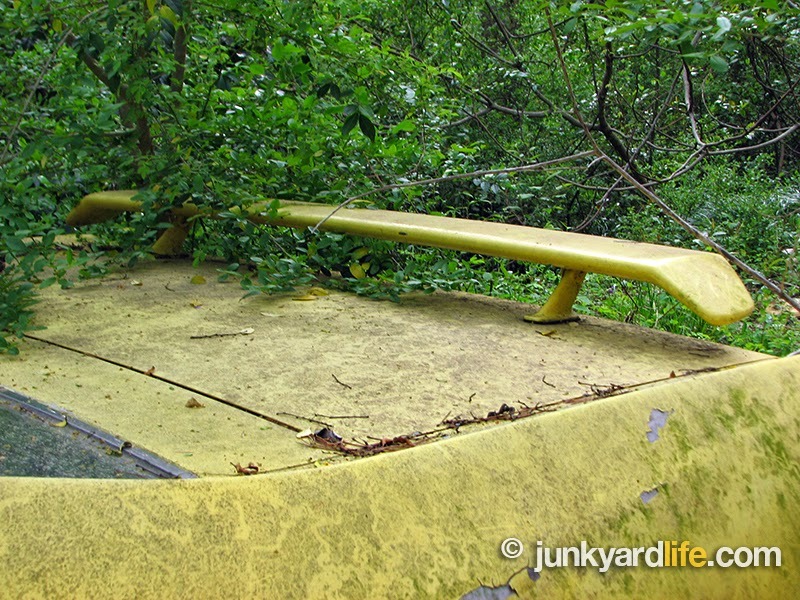 Junkyard Life’s first glance at the 1970 Mercury Cyclone Spoiler – a storm warning was coming our way! To build the Cyclone, Cyclone GT and the featured Cyclone Spoiler, Mercury used many popular, muscle car era, styling cues. In this Cyclone Spoiler, we spotted design elements from Mercury Montego, the Ford LTD, and seats that reminded us of Chevrolet’s “Houndstooth” pattern. Jody also noted how the tail lights would appeal to the Mopar crowd, Challenger fans specifically. 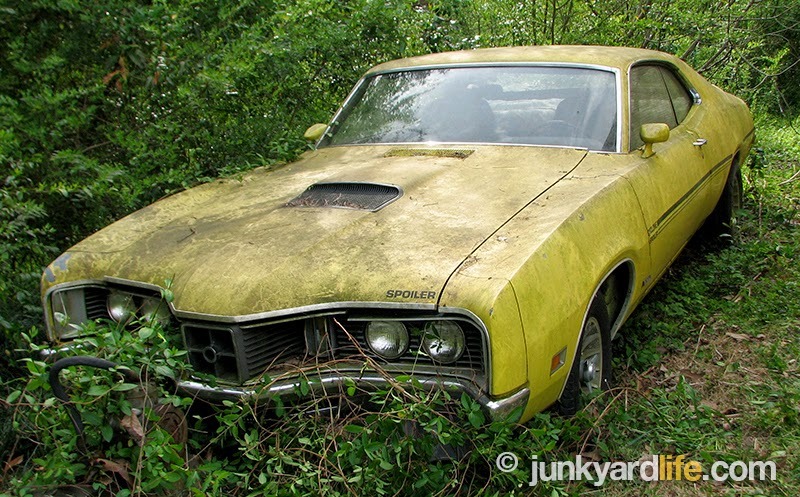 This Cyclone was a winner, all around, but unfortunately, it would not be a hit to many muscle car fans in 1970. Only a few Mercury Cyclones have been seen and enjoyed on the streets. 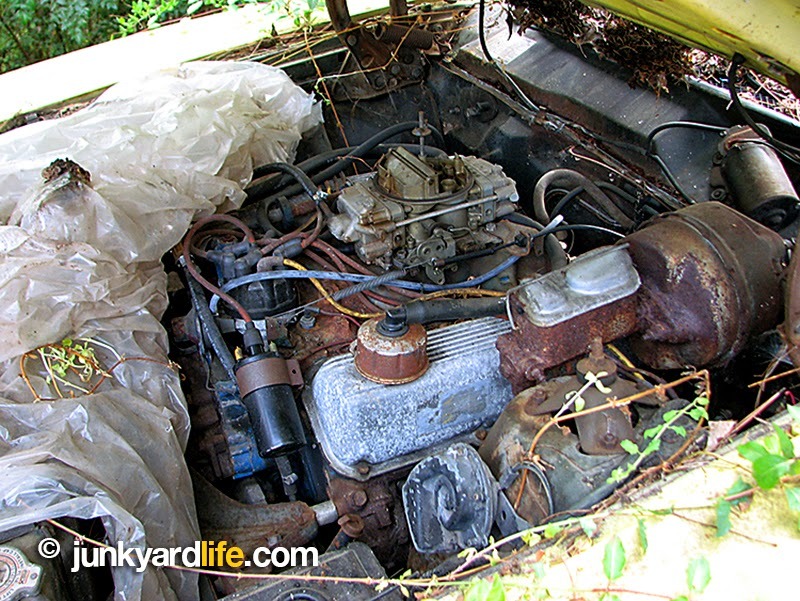 This may be the only one we, at Junkyard Life, have ever seen and it has been off the road for 20 years. Houndstooth, black and white seats compliment the ’70 Cyclone Spoiler’s interior. 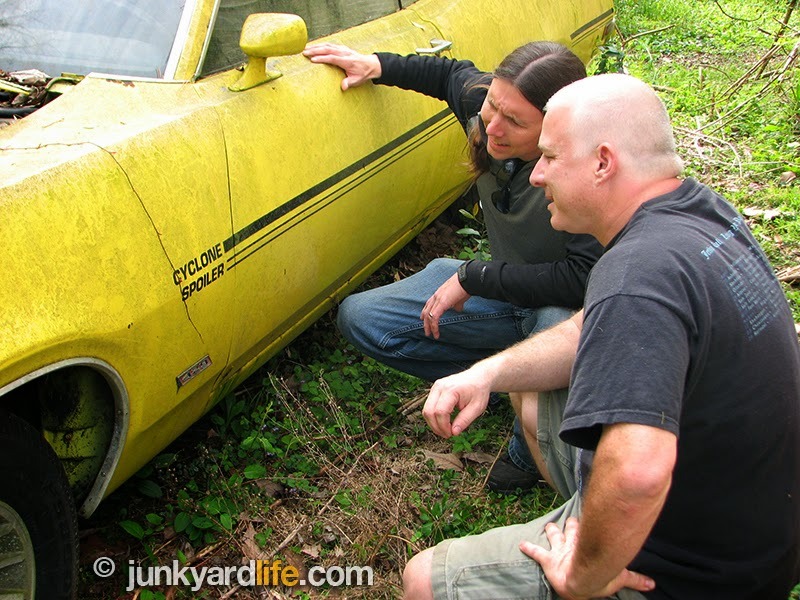 These unsuspecting clowns, Ron and Jody, studiously examine a 429 Mercury Cyclone Spoiler. That’s putting it nicely. We were dumbfounded, but ready to learn! Despite my theory that the car was named Cyclone due it being a lot of muscle car cues “whipped up” into one car. That probably wasn’t what Mercury had in mind when they named this car. It was more likely named because a cyclone is a powerful storm that is known to do damage, much like this would do to the ego of the drivers of lesser cars. We do know that the Cyclone Spoiler was named appropriately due to the spoilers on the front chin and rear deck wing, like our feature car. 1970 Mercury Cyclone Spoiler’s rear spoiler shoves the car down on the road for better stability (in theory) at HCS (High Cyclone Speed). We spotted power brakes, power steering and an owner added Holley mounted to the 370-hp 429-cubic-inch engine for more throttle-stabbing fun. 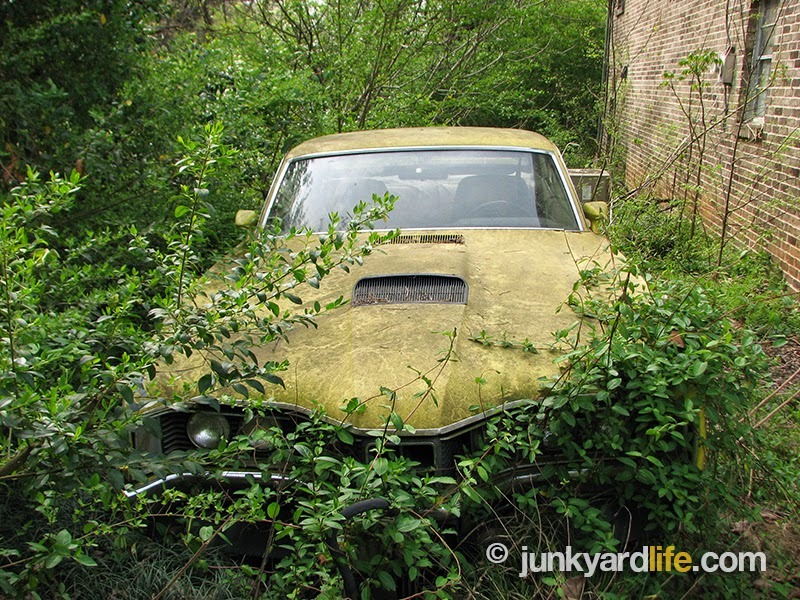 The owner of this Mercury, found in Alabama, had a gut feeling that Cyclones would be something to hold onto. The owner did one better than that, he bought every one that he found during the last three decades. He now owns four Cyclones. Two 1970 models and two 1971 models. This fantastic Cyclone Spoiler in Competition Yellow also has a Traction-Lok rear with 3.50:1 gears, and an automatic C6 transmission. 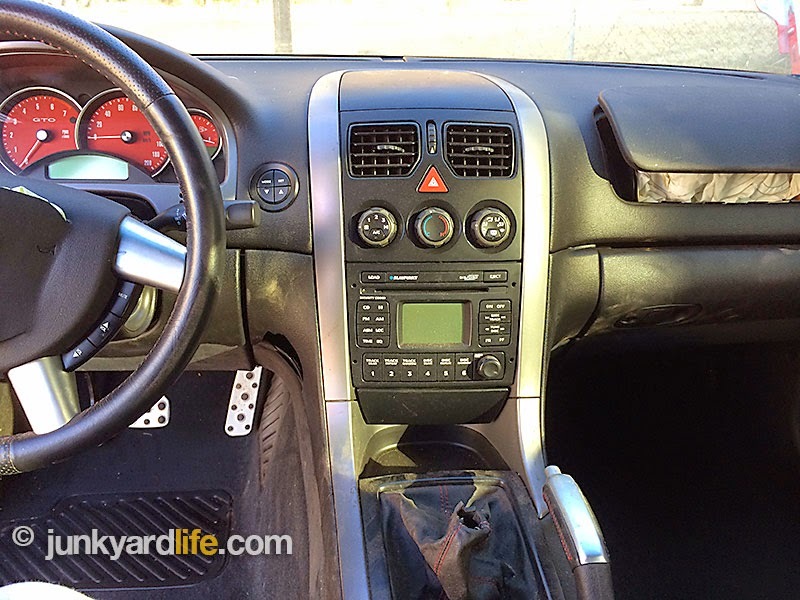 It is also an air-delete car, with manual windows and an AM radio. It was factory equipped with power brakes and power steering. 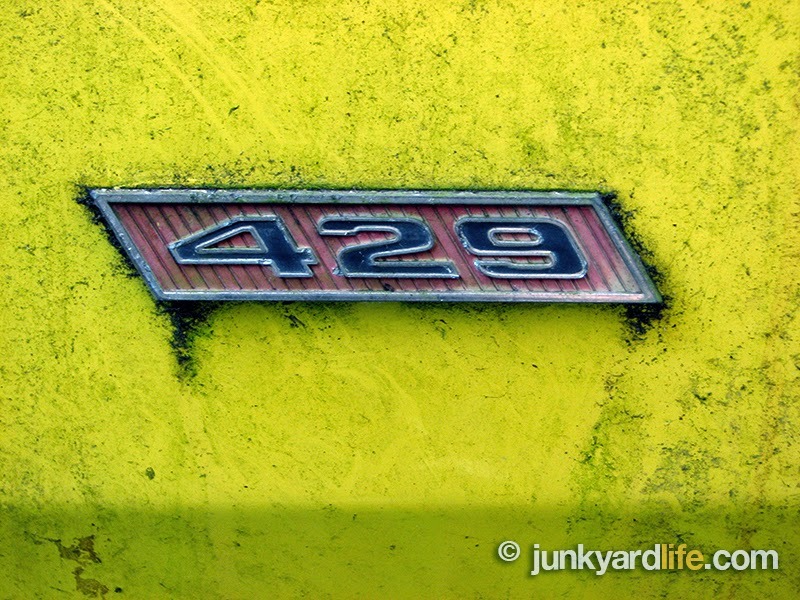 An air-delete 429 that spins both tires? We know what this car was born to do-hopefully, it will be doing it again soon if we have anything to do with it! “That’s a lot of motor for a guy!” Our dad would have said that. Competition Yellow paint, body stripes, 429 engine, Ram Air hood along with front and rear spoilers add up to one mean muscle machine circa 1970. 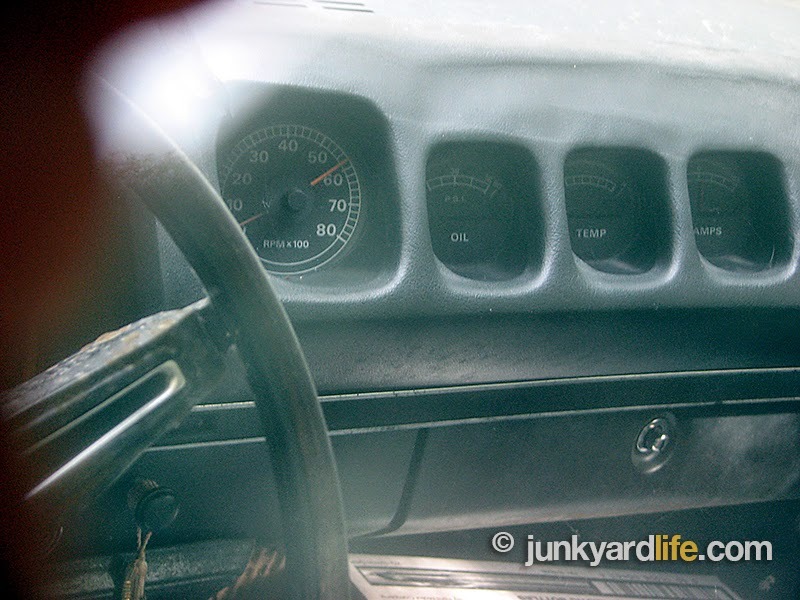 Well-preserved interior features a factory tachometer canted toward the driver, from the center of dash, and a wide sweep speedometer, in front of steering wheel. A lot of divisions had a problem combining the two, but Mercury had no issue giving us what we want. Junkyard Life loves factory tachometers. One-of-very-few 1970 Cyclone Spoilers seen in the wild. 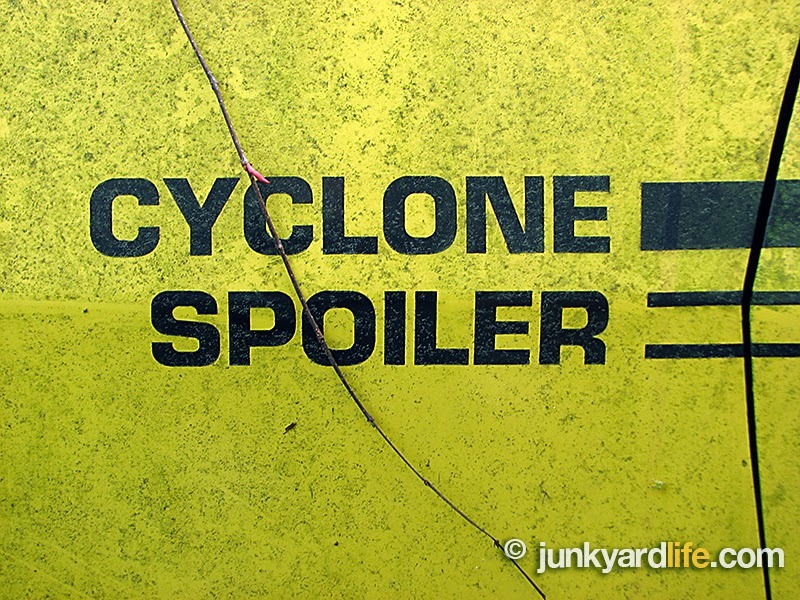 Ron Kidd moves in for a closer look at the 1970 Cyclone Spoiler. 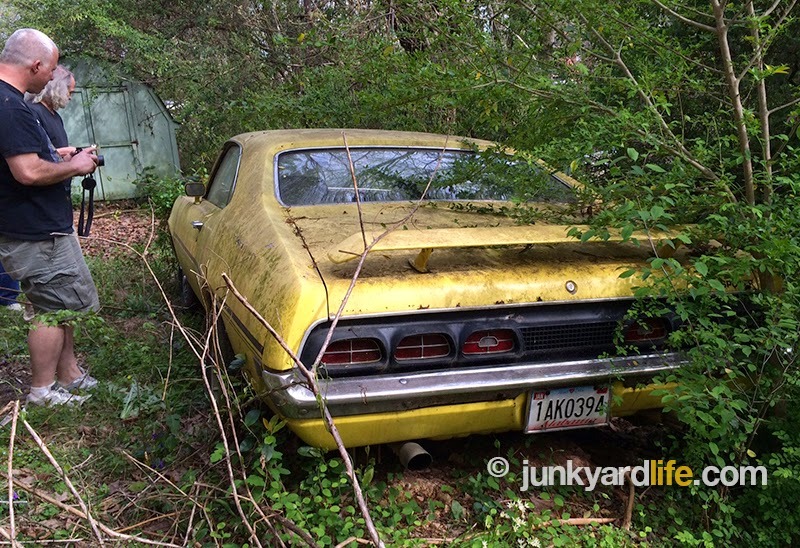 Notice the Mopar-influenced tail lights?